It’s been confirmed that learner drivers will be allowed to have lessons on motorways by next year. This change will ensure that new drivers, under supervision, will experience motorway driving and will learn about the importance of the signs and signals, lane discipline and joining and leaving motorways safely. And for many learners, there’s a good chance that they will end up driving on a ‘smart’ motorway, as they are becoming increasingly common throughout the UK. To help young drivers understand all the important rules of smart motorways, we’ve put together some information they need to know – where they can find them, how to use them and what different types of smart motorways there are. Smart motorways make use of real time traffic management techniques to reduce congestion and help traffic move more freely, with techniques including variable speed limits and ‘all lane running’ schemes. Regional traffic control centres monitor traffic closely to consistently update and amend speed limits and signs on smart motorways, informing users of any upcoming congestion or hazards. This method of reducing congestion means that there is no need for motorways to be widened with extra lanes added. Smart motorway traffic management was developed by Highways England (previously Highways Agency) to reduce cost, improve journey times and minimise our impact on the environment. This type of smart motorway has mandatory speed limits with a hard shoulder available for emergencies only. The hard shoulder can be opened during busy, peak times on the motorway when needed, reducing congestion. This type of smart motorway opens all lanes for traffic to use including a former hard shoulder and makes use of variable speed limits. Stick to the speed limits indicated, these have been displayed to prevent stop-start traffic from occurring and you could land yourself a fine if you ignore them. If no signs are displayed the national speed limit will apply. A red X signals that a lane is closed and you must not drive in it. This could be due to a broken down vehicle, a person, an animal or debris in the road. It can also indicate that a hard shoulder is currently closed, so avoid a penalty by obeying the red cross. Hard shoulders are identifiable by a solid white line separating them from other motorway lanes. On some smart motorways you can use these if there is a speed limit above the lane; if there is no sign or a red cross in the lane this means you should treat it as a regular hard shoulder, leaving it free and not using it unless there is an emergency. What happens if I break down or have an accident? With all lane running and hard shoulder running motorways you will notice intermittent refuge areas for use in emergencies. If your vehicle is unfortunate enough to experience a breakdown or get into an accident you should first switch on your hazard lights then make your way to the nearest emergency refuge area. The furthest these are separated by is 1.5 miles and are identifiable by blue signs with orange SOS telephone symbols. If this is not possible, try to get to the nearest verge if it is safe to do so and exit via the left hand door, waiting behind the safety barriers. If you cannot get to the inside lane, stay inside your vehicle with your seatbelt on and if you are in a dangerous situation unable to leave your car safely phone 999. The traffic control centre will then be able to use their smart roadside technology to manoeuvre traffic around you safely. What are Hadecs 3 cameras? The HADECS 3 speed cameras are being used on smart motorways throughout the country. Smaller and less recognisable than usual speed cameras, they are painted grey, are small and don’t rely on film to capture those speeding. They take three snapshots when triggered that are sent to enforcement staff. 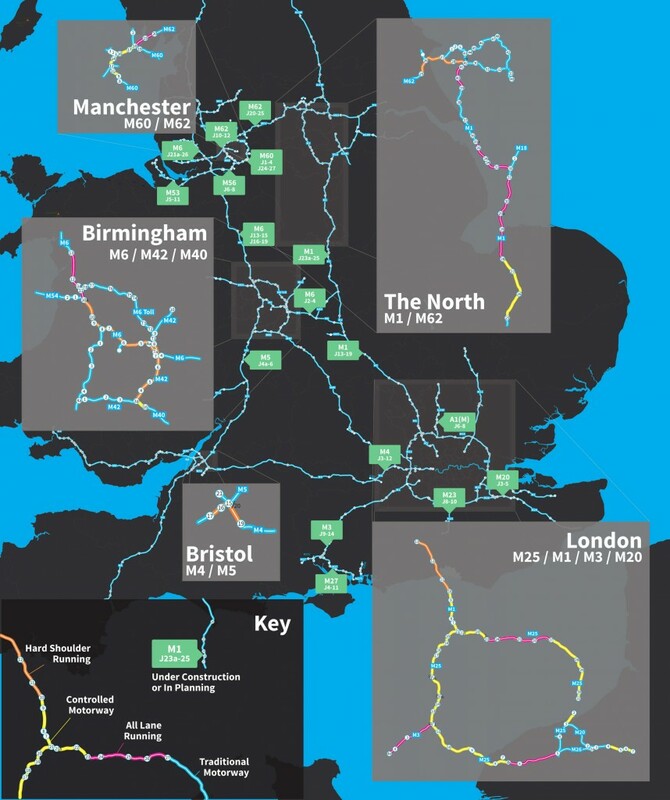 Where are Smart Motorways in the UK? Hayley is the editor of a popular motoring blog and a massive petrol head. She has been driving for over 20 years and writes regular content for a range of commercial automotive websites. This entry was posted in Advice and tagged motorway driving, motorways, smart motorways by Hayley. Bookmark the permalink.